We describe the isolation of human atrial myocytes which can be used for intracellular Ca2+ measurements in combination with electrophysiological patch-clamp studies. Voigt, N., Zhou, X. B., Dobrev, D. Isolation of Human Atrial Myocytes for Simultaneous Measurements of Ca2+ Transients and Membrane Currents. J. Vis. Exp. (77), e50235, doi:10.3791/50235 (2013). The study of electrophysiological properties of cardiac ion channels with the patch-clamp technique and the exploration of cardiac cellular Ca2+ handling abnormalities requires isolated cardiomyocytes. In addition, the possibility to investigate myocytes from patients using these techniques is an invaluable requirement to elucidate the molecular basis of cardiac diseases such as atrial fibrillation (AF).1 Here we describe a method for isolation of human atrial myocytes which are suitable for both patch-clamp studies and simultaneous measurements of intracellular Ca2+ concentrations. First, right atrial appendages obtained from patients undergoing open heart surgery are chopped into small tissue chunks ("chunk method") and washed in Ca2+-free solution. Then the tissue chunks are digested in collagenase and protease containing solutions with 20 μM Ca2+. Thereafter, the isolated myocytes are harvested by filtration and centrifugation of the tissue suspension. Finally, the Ca2+ concentration in the cell storage solution is adjusted stepwise to 0.2 mM. We briefly discuss the meaning of Ca2+ and Ca2+ buffering during the isolation process and also provide representative recordings of action potentials and membrane currents, both together with simultaneous Ca2+ transient measurements, performed in these isolated myocytes. Studying electrophysiological properties of cardiac ion channels with the patch-clamp technique and the exploration of cellular Ca2+ handling abnormalities require isolated cardiomyocytes. These are usually obtained following the in vitro exposure of cardiac tissue samples to digestive enzymes (collagenase, hyaluronidase, peptidase etc.). Since the first report of isolation of viable cardiac myocytes in 19552 a large quantity of protocols has been developed in order to harvest single atrial and ventricular cardiomyocytes from different species including mouse, rat, rabbit, dog, guinea pig and human. In this review we focus on isolation of human atrial myocytes. Regarding procedures for isolation of myocytes from other species we refer to the "Worthington Tissue Dissociation guide" provided by Worthington Biochemical Corp., USA (www.tissuedissociation.com). Experimental protocols need to be approved by the local ethics committee and all patients need to give written informed consent. Our research was approved by the ethics committee of the Medical Faculty Mannheim, University of Heidelberg (#2011-216N-MA) and was performed in compliance with all institutional, national and international guidelines for human welfare. All patients gave written informed consent. During routine cannulation procedures in patients undergoing open-heart surgery for cardiopulmonary bypass grafting, the tip of the right atrial appendage is usually removed and can be used for isolation of atrial cardiomyocytes. After excision the tissue sample is transferred immediately into a 50 ml Falcon tube with sterile Ca2+-free transport solution containing 2,3-butanedione monoxime (Table I; BDM, contractile inhibitor, preventing myocyte contracture). With transport times between 30 and 45 min, we did not recognize a clear advantage of cooling or oxygenation with respect to both number and quality of isolated atrial cardiomyocytes. In general transport to the lab should be as quick as possible. However, if longer transportation time cannot be avoided, transport at 4 °C in oxygenated solution might be advantageous. Switch on the thermocirculator, which controls the temperature of the jacketed beaker (Table II). Make sure the temperature within the beaker equals 37 °C. Cover the beaker with a glass lid to maintain a constant temperature within the beaker throughout the whole isolation process. Weigh the Collagenase I and Protease XXIV into three glass beakers and store it at room temperature. The enzymes will be diluted just before use. Store 20 ml of Ca2+ free solution in a Petri dish at 4 °C. Store 250 ml of Ca2+ free solution in a water bath at 37 °C. Transfer the tissue sample together with the transport solution into a Petri dish (~10 cm diameter) and remove fatty tissue roughly using scissors. Weigh the tissue sample. Between 200 and 600 mg are used for cell isolation. The remaining tissue can be frozen in liquid nitrogen for later biochemical analysis. Transfer the tissue sample into the Petri dish containing 20 ml Ca2+ free solution at 4 °C (see step 1.3) and chop the tissue sample into small chunks of approximately 1 mm3 in size. The following steps should be executed at 37 °C and under continuous gassing with 100% O2. A pipette tip can be placed onto the oxygen tube to avoid strong bubbling and generate continuous air flow. Transfer the tissue chunks together with the Ca2+-free solution into the jacketed beaker and stir carefully for about 3 min with a magnetic stirring bar. Stop stirring and allow the tissue chunks to settle down for a few seconds. Carefully strain the supernatant through a nylon mesh (200 μm, Table II). Return the restrained tissue chunks from the mesh into the beaker using forceps. Refill the beaker with Ca2+ free solution and repeat the washing step 2.4 and 2.5 two times. Re-suspend the tissue chunks with 20 ml Enzyme solution E1 (Table I) containing collagenase and protease and stir carefully for 10 min. Add 40 μl of 10 mM CaCl2-solution to obtain a final concentration of 20 μM Ca2+. After 35 min strain the supernatant carefully through a nylon mesh (200 μm, Table II) in a way that most of the tissue chunks remain in the beaker. Return restrained tissue chunks from the mesh into the beaker. Resuspend the tissue chunks again with 20 ml enzyme solution E2 containing collagenase I only (Table I). Add 40 μl of 10 mM CaCl2-solution immediately to obtain a final concentration of 20 μM Ca2+. During the second digestion use scissors to further chop tissue clots occasionally. After 5 min take a sample using a Pasteur pipette to check the dissociation of cells. Repeat this every 2-3 min until rod-shaped, striated cardiomyocytes appear. Stop stirring and allow the tissue chunks to settle down for about 20-30 sec. Strain the supernatant carefully through a nylon mesh (200 μm, Table II) into a 50 ml Falcon tube (Tube A). Return the restrained tissue chunks from the mesh into the beaker. Re-suspend the tissue chunks in the beaker with 20 ml storage solution (Table I)10 and further dissociate the cells by gentle mechanical trituration using a 20 ml serological pipette with dispenser. Try to avoid bubble formation since bubbles are detrimental to cell survival and quality. Strain the supernatant carefully through a nylon mesh (200 μm, Table II) into a 50 ml Falcon Tube (Tube B). Centrifuge both Falcon tubes A and B (see step 4.5 and 4.7) at 95 x g for 10 min. Remove the supernatant from both tubes carefully by aspiration. Make sure not to disturb the pellet. Discard the supernatant. Re-suspend both pellets in 1.5 ml storage solution (Table I) each (room temperature). Add two times 7.5 μl of 10 mM CaCl2 solution to each Falcon and stir carefully. Incubate for 10 min after each step. Add 15 μl of 10 mM CaCl2 solution to obtain a final Ca2+ concentration of 0.2 mM. Transfer 1.5 ml of cell suspension (tube A and/or tube B) into a 2 ml microcentrifuge tube (Eppendorf tube). The following steps should be executed under consideration of the light sensitivity of the fluorescent Ca2+ Indicator Fluo-3. Dissolve 50 μg of the membrane permeable acetoxymethyl ester derivative of Fluo-3 (Fluo-3 AM, Table III) in 44 μl of the Pluronic F-127 (Table III) stock solution (20% w/v in anhydrous DMSO) to get a 1 mM Fluo-3 AM stock solution, which can be stored at -20 °C for at most 1 week. Add 15 μl of the Fluo-3 AM stock solution to the microcentrifuge tube containing 1.5 ml of cell suspension (see step 6.1) and agitate carefully. Incubate the cell suspension for 10 min in an optically opaque box. Briefly centrifuge at about 6,000 rpm. Discard the supernatant and re-suspend the pellet in 1.5 ml bath solution (Table IV). Leave the cell suspension for about 30 min for de-esterification before beginning with experiments. Since patch-clamp measurements are not the major topic of this review, we refer the interested reader to other publications providing a more in depth description of this technique.11-14 For the sake of completeness we provide a brief summary of a protocol to measure action potentials or L-type Ca2+ currents, both together with simultaneous Ca2+-transient recordings. where kd=dissociation constant of Fluo-3 (864 nM), F=Fluo-3 fluorescence; Fmax=Ca2+-saturated fluorescence obtained at the end of each experiment.12 Both electrical signals and epifluorescent Ca2+ signals are recorded simultaneously. 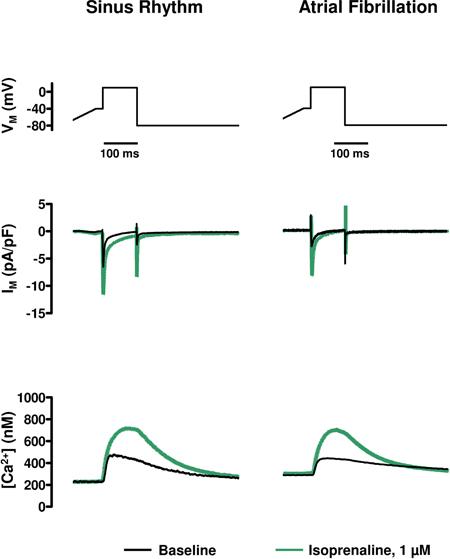 Action potentials are stimulated at 0.5 Hz in current-clamp mode using 1 msec current pulses of 1.2x threshold strength. L-type Ca2+-currents are measured in voltage-clamp mode using a holding potential of -80 mV and a 100-msec ramp-pulse to -40 mV to inactivate the fast Na+-current, followed by a 100-msec test-pulse to +10 mV at 0.5 Hz. Figure 2A shows three representative examples from isolated human right atrial myocytes. To quantify the cell yield we pipette 10 μl of cell suspension (step 5.5) on a CellFinder microscope slide (http://www.antenna.nl/microlab/index-uk.html). Averaged cell yields in Figure 2B clearly indicate that there is a tendency to lower cell yields in chronic AF (cAF) patient samples (tube A: 16.5±3.1 cells/10 μl (n=29) vs. 5.1±2.3 cells/10 μl (n=10) in SR and cAF, respectively, p<0.05; tube B: 17.9±3.9 cells/10 μl (n=29) vs. 5.9±2.0 cells/10 μl (n=9) in SR and cAF, respectively, p=0.107). Representative examples of action-potential measurements and simultaneous recordings of cytosolic Ca2+ transients are given in Figure 3. In about 90% of the investigated cells, the action-potential-triggered Ca2+ release causes clear and regular cell contractions. As reported previously, the resting membrane potential, which is an accepted indicator for cell integrity, averaged about -73.9±2.7 mV (n = 23/10 myocytes/patients) and -77.7±1.8 mV (n = 19/8 myocytes/patients) in SR and cAF respectively (p>0.05).15 Figure 4 shows representative simultaneous recordings of voltage-gated L-type Ca2+ currents and cytosolic Ca2+ transients. Application of the non-selective β-adrenoceptor agonist isoprenaline (1 μM) increases amplitudes of both ICa,L and cytosolic Ca2+ transients, suggesting intact β-adrenergic signal transduction cascade. Figure 1. 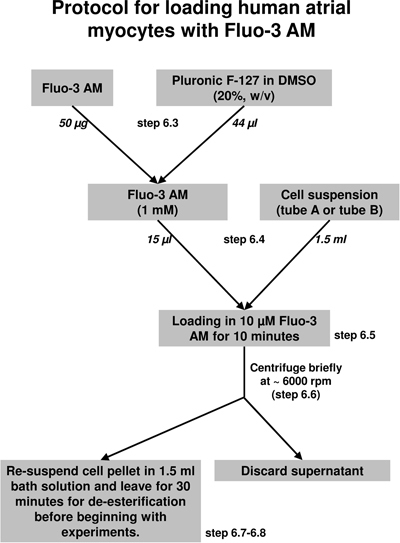 Flow chart of the myocytes Fluo-3 AM loading protocol (see step 6.1-6.5). m/v, mass/volume. Figure 2. A, Isolated human right atrial myocytes after one hour in storage solution. B, Mean±SEM of the cell yield counted in 10 μl of cells in storage solution (see step 5.5). n refers to the number of preparations within each group. *p<0.05. Table III. Substances for loading of myocytes with Fluo-3 AM. Table IV. Bath solution for patch-clamp. Table V. Pipette solution for patch-clamp*. Here we describe a method for isolation of human atrial myocytes from right atrial appendages obtained from patients undergoing open heart surgery. In order to use these myocytes for measurements of cytosolic Ca2+ we adapted a previously described method4-11 by omitting EGTA from the storage solution. Already in 1970 it was observed that although myocytes dissociate in the presence of Ca2+ during digestion, all of them were in contracture and non-viable.16,17 Therefore, cell isolation is performed in Ca2+-free solution. However, the re-introduction of physiological concentrations of Ca2+ resulted in rapid Ca2+ influx and cell death. This has been described as the Ca2+ paradox phenomenon which was originally observed in perfused hearts by Zimmerman and Hulsman.18 Modifications of the isolation media including reduction of the pH to 7.0,19 addition of taurin20 or of small amounts of Ca2+ (see step 3.2 and 4.1),21 as well as storage of isolated myocytes in EGTA containing storage-solution22 have been suggested to prevent the Ca2+ paradox.17 However, it is well known that Ca2+ buffering through EGTA reduces the amplitude of L-type Ca2+ current-induced Ca2+ transient amplitudes and results in a biphasic decay of the Ca2+ transients.23 Therefore, we omitted EGTA throughout the whole isolation process in order to obtain Ca2+ transients with typical properties and monophasic decays. To protect the cells from the Ca2+ paradox we increased the final Ca2+ concentration of the storage solution in a stepwise manner until 0.2 mM. The choice of collagenase is probably the most critical step for successful myocyte isolation. Conventional collagenases are crude preparations obtained from Clostridium histolyticum and contain collagenase in addition to a number of other proteinases, polysaccharidases and lipases. Based on their general composition collagenases are subdivided into different types.24 Worthington collagenase Types I and II have been successfully used for isolation of human atrial myocytes.4-10,15,25-30 In our presently described protocol we recommend the use of collagenase Type I, although we were also able to obtain acceptable amounts of viable cells using collagenase Type II. However, even within a single collagenase type there is a significant batch-to-batch variation regarding the enzyme activities. These variations require careful batch selection and testing of various batches to optimize isolation procedure. The online available batch-selection tool from Worthington Biochemical Corp. (http://www.worthington-biochem.com/cls/match.php) may be used to find available batches with a composition that has been shown to be suitable for the isolation of human atrial myocytes. Currently we use collagenase type I with 250 U/mg collagenase activity, 345 U/mg caseinase activity, 2.16 U/mg clostripain activity and 0.48 U/mg tryptic activity (lot# 49H11338). The cells obtained using the procedure described in this manuscript may be used within 8 hr for patch-clamp studies, Ca2+ transient measurements and a combination of both.15 In addition, these cells allow measurements of cellular contraction in response to electric field stimulation or electric stimulation using the patch-clamp pipette (unpublished observations). Worthington Biochemical Corp. supported this publication by covering production costs of video file. The funders had no role in study design, data collection and analysis, decision to publish, or preparation of the manuscript. In addition, we thank the cardiac surgeons at Heidelberg University for the provision of human atrial tissue and Claudia Liebetrau, Katrin Kupser and Ramona Nagel for their excellent technical support. Special thanks also to Andy W. Trafford for his helpful suggestions and advice during the establishment of the Ca2+ transient measurements. The authors wish to express their deepest gratitude to the members of the Department of Pharmacology and Toxicology (head: Ursula Ravens) of the Dresden University of Technology for the opportunity they offered us to learn basic techniques and skills in cellular electrophysiology and cardiomyocyte isolation. The authors' research is supported by the German Research Foundation (Do769/1-1-3), the German Federal Ministry of Education and Research through the Atrial Fibrillation Competence Network (01Gi0204) and the German Centre for Cardiovascular Research, the European Union through the European Network for Translational Research in Atrial Fibrillation (EUTRAF, FP7-HEALTH-2010, large-scale integrating project, Proposal No. 261057) and the European-North American Atrial Fibrillation Research Alliance (ENAFRA) grant of Fondation Leducq (07CVD03). The schematic overview shown in the video file was produced using Servier medical art. Concentrations in mM unless otherwise stated. BDM, 2,3-Butanedione monoxime. 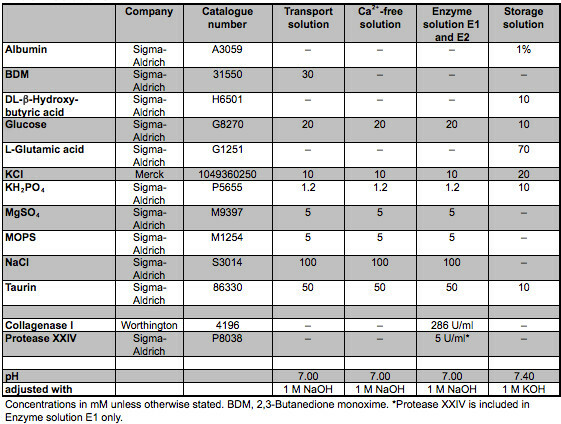 *Protease XXIV is included in Enzyme solution E1 only. Table IV. Bath solution for patch-clamp. 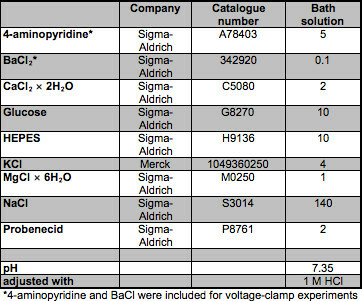 *4-aminopyridine and BaCl were included for voltage-clamp experiments only. Table V. Pipette solution for patch-clamp*. 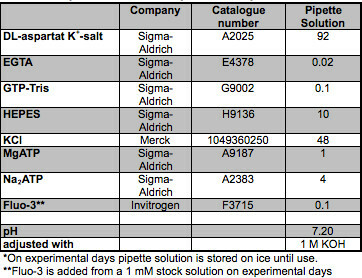 *On experimental days pipette solution is stored on ice until use. **Fluo-3 is added from a 1 mM stock solution on experimental days. Wakili, R., Voigt, N., Kaab, S., Dobrev, D., Nattel, S. Recent advances in the molecular pathophysiology of atrial fibrillation. J. Clin. Invest. 121, 2955-2968 (2011). Margaret, W. C. Pulsation, migration and division in dissociated chick embryo heart cells in vitro. Journal of Experimental Zoology. 128, 573-589 (1955). Bustamante, J. O., Watanabe, T., Murphy, D. A., McDonald, T. F. Isolation of single atrial and ventricular cells from the human heart. Can. Med. Assoc. J. 126, 791-793 (1982). Dobrev, D., et al. G-Protein β3-subunit 825T allele is associated with enhanced human atrial inward rectifier potassium currents. Circulation. 102, 692-697 (2000). Voigt, N., et al. Differential phosphorylation-dependent regulation of constitutively active and muscarinic receptor-activated IK,ACh channels in patients with chronic atrial fibrillation. Cardiovasc. Res. 74, 426-437 (2007). Voigt, N., et al. Inhibition of IK,ACh current may contribute to clinical efficacy of class I and class III antiarrhythmic drugs in patients with atrial fibrillation. Naunyn. Schmiedebergs Arch. Pharmacol. 381, 251-259 (2010). Dobrev, D., et al. The G protein-gated potassium current IK,ACh is constitutively active in patients with chronic atrial fibrillation. Circulation. 112, 3697-3706 (2005). Voigt, N., et al. Left-to-right atrial inward rectifier potassium current gradients in patients with paroxysmal versus chronic atrial fibrillation. Circ. Arrhythm. Electrophysiol. 3, 472-480 (2010). Amos, G. J., et al. Differences between outward currents of human atrial and subepicardial ventricular myocytes. J. Physiol. 491, (Pt. 1), 31-50 (1996). 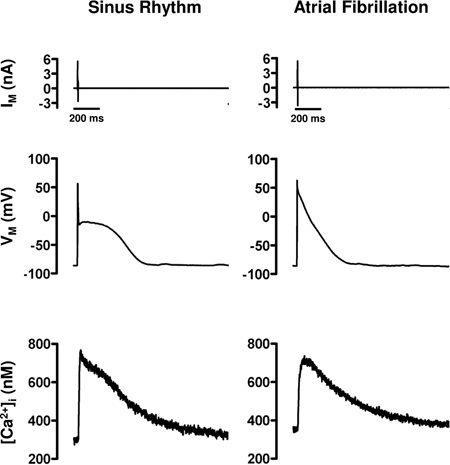 Feng, J., Xu, D., Wang, Z., Nattel, S. Ultrarapid delayed rectifier current inactivation in human atrial myocytes: properties and consequences. Am. J. Physiol. 275, H1717-H1725 (1998). Voigt, N., Makary, S., Nattel, S., Dobrev, D. Voltage-clamp-based methods for the detection of constitutively active acetylcholine-gated IK,ACh channels in the diseased heart. Methods Enzymol. 484, 653-675 (2010). Trafford, A. W., Diaz, M. E., Eisner, D. A. A novel, rapid and reversible method to measure Ca2+ buffering and time-course of total sarcoplasmic reticulum Ca2+ content in cardiac ventricular myocytes. Pflugers Arch. 437, 501-503 (1999). Voigt, N., Nattel, S., Dobrev, D. Proarrhythmic atrial calcium cycling in the diseased heart. Adv. Exp. Med. Biol. 740, 1175-1191 (2012). Hamill, O. P., Marty, A., Neher, E., Sakmann, B., Sigworth, F. J. Improved patch-clamp techniques for high-resolution current recording from cells and cell-free membrane patches. Pflugers Arch. 391, 85-100 (1981). Voigt, N., et al. Enhanced sarcoplasmic reticulum Ca2+ leak and increased Na+-Ca2+ exchanger function underlie delayed afterdepolarizations in patients with chronic atrial fibrillation. Circulation. 125, 2059-2070 (2012). Berry, M. N., Friend, D. S., Scheuer, J. Morphology and metabolism of intact muscle cells isolated from adult rat heart. Circ Res. 26, 679-687 (1970). Farmer, B. B., Mancina, M., Williams, E. S., Watanabe, A. M. Isolation of calcium tolerant myocytes from adult rat hearts: review of the literature and description of a method. Life Sci. 33, 1-18 (1983). Zimmerman, A. N., Hulsmann, W. C. Paradoxical influence of calcium ions on the permeability of the cell membranes of the isolated rat heart. Nature. 211, 646-647 (1966). Bielecki, K. The influence of changes in pH of the perfusion fluid on the occurrence of the calcium paradox in the isolated rat heart. Cardiovasc. Res. 3, 268-271 (1969). Kramer, J. H., Chovan, J. P., Schaffer, S. W. Effect of taurine on calcium paradox and ischemic heart failure. Am. J. Physiol. 240, H238-H246 (1981). Rich, T. L., Langer, G. A. Calcium depletion in rabbit myocardium. Calcium paradox protection by hypothermia and cation substitution. Circ. Res. 51, 131-141 (1982). Isenberg, G., Klockner, U. Calcium tolerant ventricular myocytes prepared by preincubation in a "KB medium". Pflugers Arch. 395, 6-18 (1982). Diaz, M. E., Trafford, A. W., Eisner, D. A. The effects of exogenous calcium buffers on the systolic calcium transient in rat ventricular myocytes. Biophys. J. 80, (01), 1915-1925 (2001). Worthington, K., Worthington, V. Worthington Enzyme Manual. (1993). Christ, T., et al. Pathology-specific effects of the IKur/Ito/IK,ACh blocker AVE0118 on ion channels in human chronic atrial fibrillation. Br. J. Pharmacol. 154, 1619-1630 (2008). Dobrev, D., et al. Molecular basis of downregulation of G-protein-coupled inward rectifying K+ current IK,ACh in chronic human atrial fibrillation: decrease in GIRK4 mRNA correlates with reduced IK,ACh and muscarinic receptor-mediated shortening of action potentials. Circulation. 104, 2551-2557 (2001). Hatem, S. N., et al. Different compartments of sarcoplasmic reticulum participate in the excitation-contraction coupling process in human atrial myocytes. Circ. Res. 80, 345-353 (1997). Heidbuchel, H., Vereecke, J., Carmeliet, E. Three different potassium channels in human atrium. Contribution to the basal potassium conductance. Circ. Res. 66, 1277-1286 (1990). Hove-Madsen, L., et al. 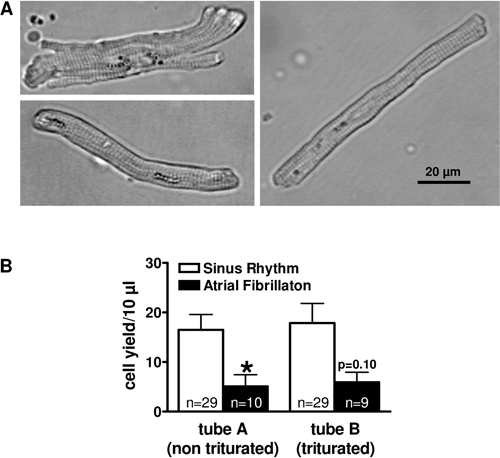 Atrial fibrillation is associated with increased spontaneous calcium release from the sarcoplasmic reticulum in human atrial myocytes. Circulation. 110, 1358-1363 (2004). Molina, C. E., et al. Cyclic adenosine monophosphate phosphodiesterase type 4 protects against atrial arrhythmias. J. Am. Coll. Cardiol. 59, 2182-2190 (2012).